BO (JO) STAFF sold at the lowest price, Guaranteed. A bong (Korean term) or kon (Chinese term), is a very tall and long staff item used in Okinawa and feudal Japan. Bō are typically around 1.8 m (5.9 ft) long and used in Japanese martial arts, in particular; jutsu. 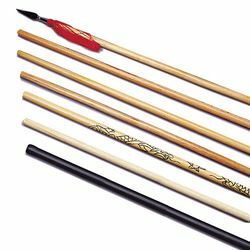 Other staff-related item are the jo which is 1.212 m (47.7 in) long and the hanp; (half bo;) (tahn bong in Korea) which is 90 cm (35 in) long. The Japanese martial art of wielding the bō is bōjutsu. The basis of bō technique is te, or hand, techniques derived from Quanfa and other martial arts that reached Okinawa via trade and Chinese monks. Thrusting, swinging, and striking techniques often resemble empty-hand movements, following the philosophy that the bō is merely an "extension of oneÕs limbs". Consequently, bo; jutsu is often incorporated into other styles of empty hand fighting, such as karate.